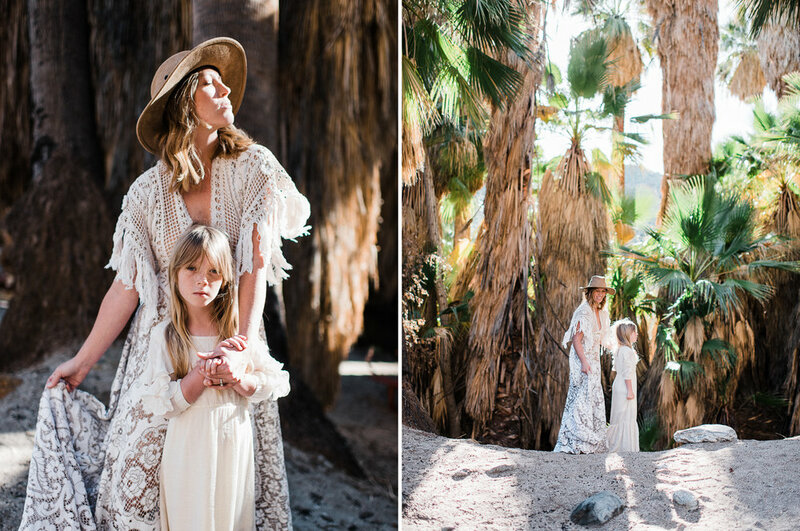 After the 4 hour styled film shoot with Savan Photography, I headed out to Indian Canyons for the “Mother and Child in Harsh Light” shoot with Twyla Jones. Twyla’s work is INCREDIBLE - so rich and moody. I set a goal for myself to try as many new things as possible at Photo Native and shooting in harsh light is way out of the box for me. I loved learning from Twyla and this real-life mother and daughter duo were so sweet and easy to photograph. This shoot started in harsh light, but ended up with beautiful backlight (my sweet spot!) so we really had the best of both worlds. I think you will notice the shift in light as you scroll through the blog post. A little behind the scenes with Twyla Jones. I highly recommend a trip to Indian Canyons if you visit the Palm Springs area. This was only about 10 minutes away from the Ace Hotel (where we were staying). Thank you to the incredible vendors for putting together such a gorgeous styled shoot - everything was fabulous!